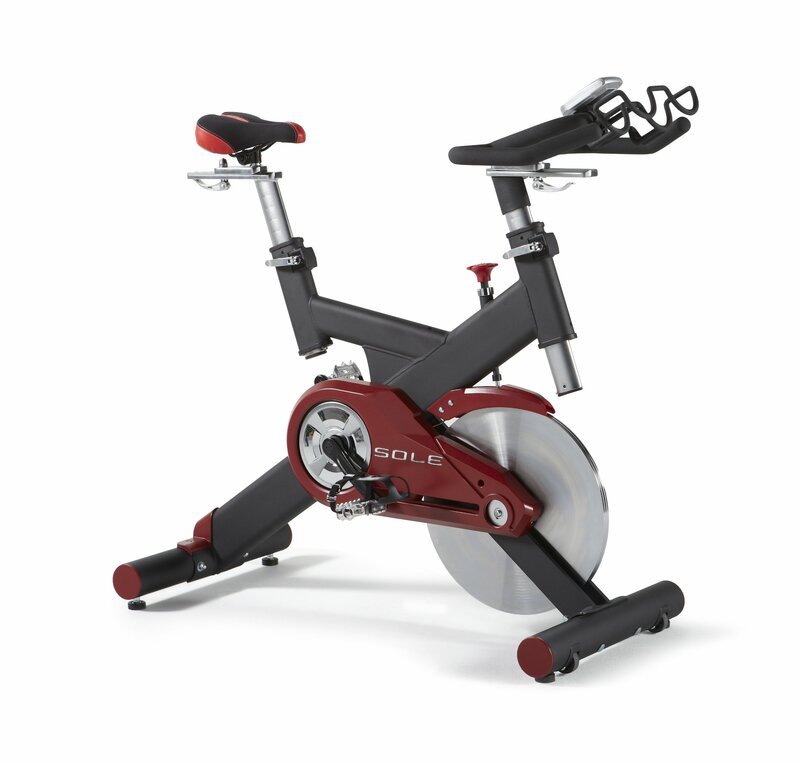 Stationary biking is taken to the next level with the Sole Fitness SB700 Indoor Cycle. It boasts a wide assortment of adjustable sections including fore and aft and up and down for both the seat and handle bars. Its integrated backlit LCD console displays RPM, time, Kcal, speed and distance in large, easy to read numbers. The machine also comes with a wireless chest strap for heart rate monitoring. The pedals are designed to have a 2 degree slant to prevent aches in the knees and feet by supporting continual correct alignment throughout the duration of the workout. For a sturdy frame, the bike is made of heavy steel tubing and aluminum shroud for an incredibly durable bike. There are two wheels along the front that act as touch points to make moving the bike easy. Its fly wheel is forty-eight pounds and has a knob right below the handle bars for easy adjustment of resistance during every workout. If you are going to invest in a stationary bike, the hardest challenge to befall you will be finding one that fits your size. Since companies have yet to make every item ordered customized to fit the customer’s size, this means having as much adjustability as possible in a mass produced machine is a must. Here is where the SB700 excels. Most bikes only allow for adjustments in the seat and even then only forward and backward. By taking this further and giving forward, backward, up and down movement to the seat and handlebars, this is a well-suited piece of equipment for every body type and every height. Different angles in relation to the pedals provide further types of exercises for the legs, making this machine more than just a regular stationary bike. The build of the bike itself is incredibly solid, making it a great addition for any type of ground including carpet. Because of its heavy flywheel, it is a very steady ride with absolutely no shaking or wobbling that can come from other spin bikes. With a solid piece of metal as the flywheel, the bike is as silent as a spin bike can be. It is also laid out in such a way that it always feels securely grounded. As a part of the frame, it’s important to mention the resistance knob. Unlike other bikes, when it is turned to either increase or decrease pressure, the change is just as smooth as the ride itself with no signs of vibrations, pulsing or squealing. Finally, customer reviews commonly mention their positive experiences with customer service. Due to factors unknown, many received boxes that were damaged or pieces that were bent. After contacting the company, they were immediately sent either replacement parts or new bikes at no cost to the customer. Even if the newly shipped parts still have issues, they will keep working with the customer until everything is working smoothly. Undoubtedly, a solid piece of metal is heavy, and a 48 pound wheel made from pure steel and coated with chrome is no exception. The bike ends up weighing about 150 pounds assembled. Keep this in mind because if you end up building it downstairs and want to move it upstairs, the only feasible way would either be with at least two others to help carry it or to disassemble it and bring the parts up one by one. Though it does have the front wheels, such weight on a bike makes it cumbersome, and it can be difficult to move around for some. Wireless interference has been noted. Say, for instance, you want to listen to a podcast while tracking your heart rate. The interference will cause erratic readings of your heart rate until the offending wireless device is moved to a different part of the room. So far there have been no reported fixes for this. The biggest issue seems to come with the massive flywheel. Many report getting wheels that are warped. While customer service is quick to respond, often the new one will be warped as well or even come missing the magnet that indicates your stats to the LCD display. So long as you are comfortable taking the chance that you might have to wait for a good replacement wheel, this should be no issue to fix. The Sole Fitness SB700 Exercise Bike is, hands down, one of the most approved of spin bikes in circulation. Though heavy, it is so silent and smooth that users don’t have to crank up the television or radio and can even hold conversations without screaming. Designed with a handlebar and seat that can adjust up, down, backward and forward, even individuals as tall as 6’7 can comfortably use it though the extreme height may make seem a tad unstable at the base. In comparison to its competitors, the SB700 leans more toward the expensive side of median spin bike prices, and users are happy to agree that cheaper bikes lack what makes it great and expensive bikes have everything it sports. 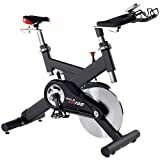 If you feel you are a regular enough practitioner of spinning and are ready to own a solid machine that has all of the strengths and very few weaknesses, this is a bike worth investing in.